So, what is effective project management and how can I make it better? – You may ask. Project management has been a trending topic among businesses wandering around for decades. People consider it one of the most vital aspects of doing and managing tasks involving projects. All the tasks that you perform in your business can be considered as a project. That is why, managing the tasks properly is very important and if you cannot manage your project, it will surely become a false economy. This makes effective project management an integral part of any business. 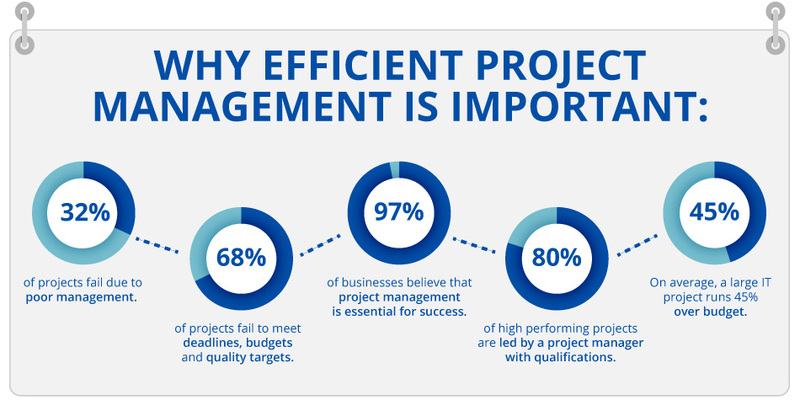 Due to the lack of efficient project management, 32% of projects fail. Besides that, around 97% of businesses around the world think that project management is important for success. The following infographic says it all. So, how can you manage your projects easily and reach the ultimate desirable outcome? There are many tools out there that help to solve this. 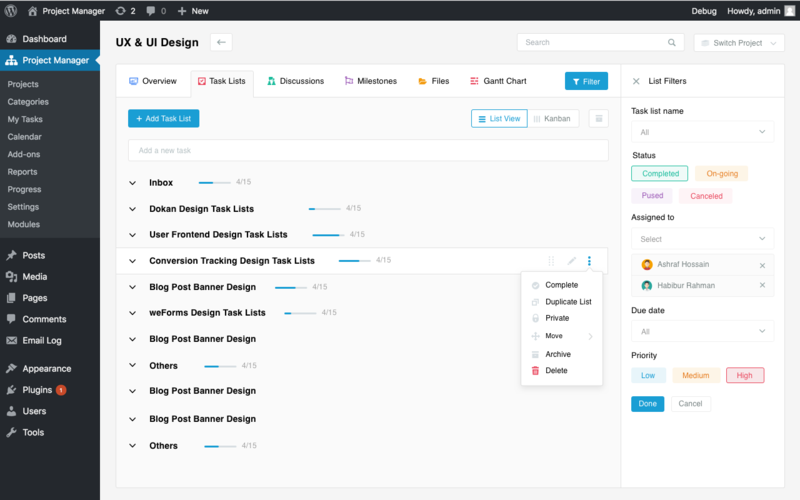 When you are using WordPress to power up your website, there is also a tool that is capable of managing projects efficiently. 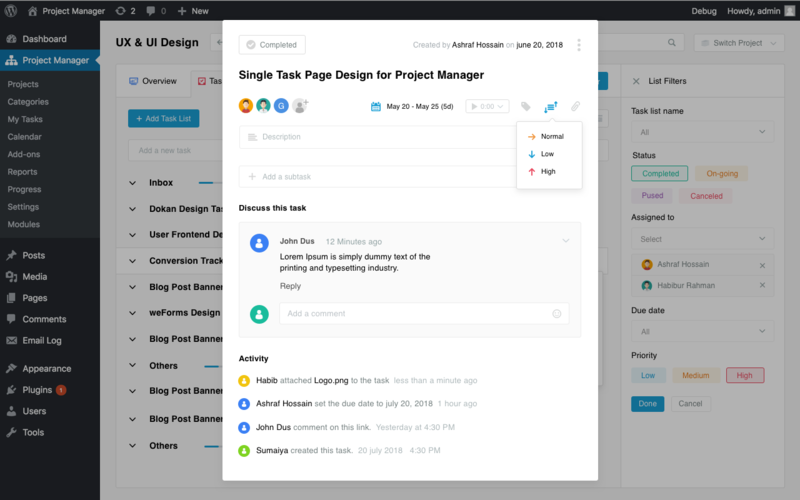 A popular name in WordPress and one of the most aspiring project management tools out there, WP Project Manager is capable of providing features; helping more than 4000 individuals and businesses all around the world. It has been downloaded around 1,38,850 times. 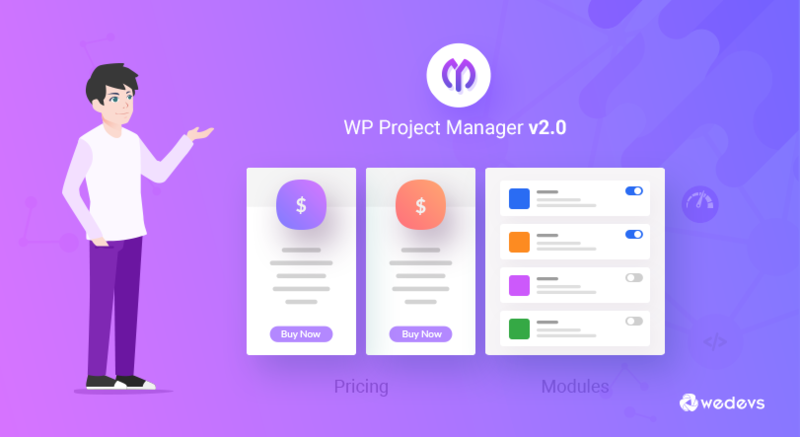 Recently, we released v2.0 of WP Project Manager and completely revamped the way it operated before keeping effective project management in mind. Now, you can experience blazing fast experience while managing your projects efficiently like a pro. Besides that, all the premium extensions are now modules that comes with the Pro packages for FREE! 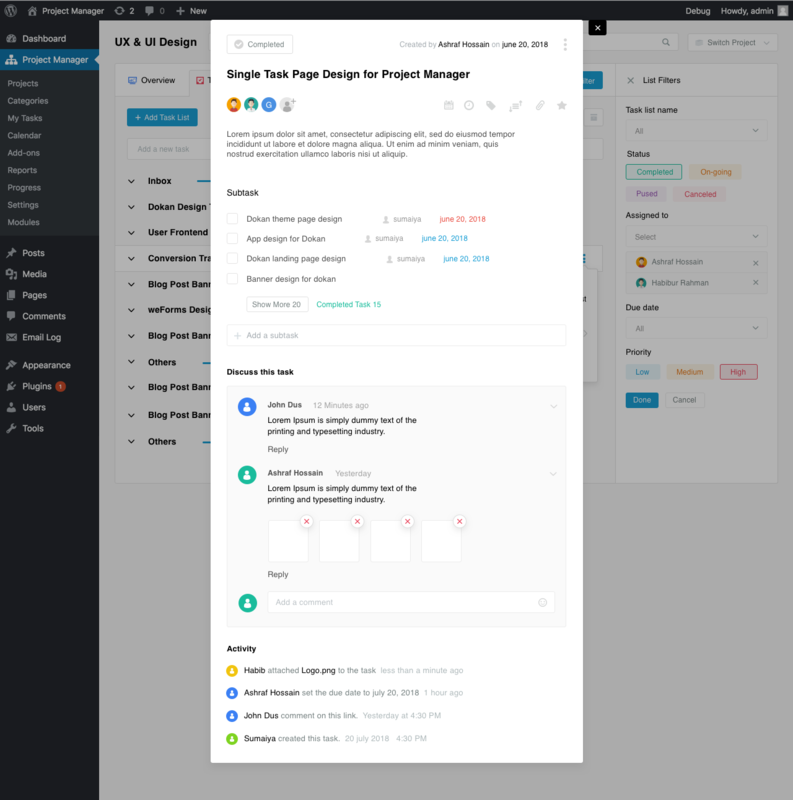 WP Project Manager is now a one-page app that loads instantly and gives you a smooth experience. This time around, we thought why not improve the way it looks. Thus, our team started working on to find a new design that can accommodate all the features and also gives ease of use. Our Product Design team worked hard to come up with an excellent mockup that would completely change the way it looked before. And interestingly, it won't conflict with any of the previous functionalities. Adding more to that, our users will get some amazing new features in the process as well! 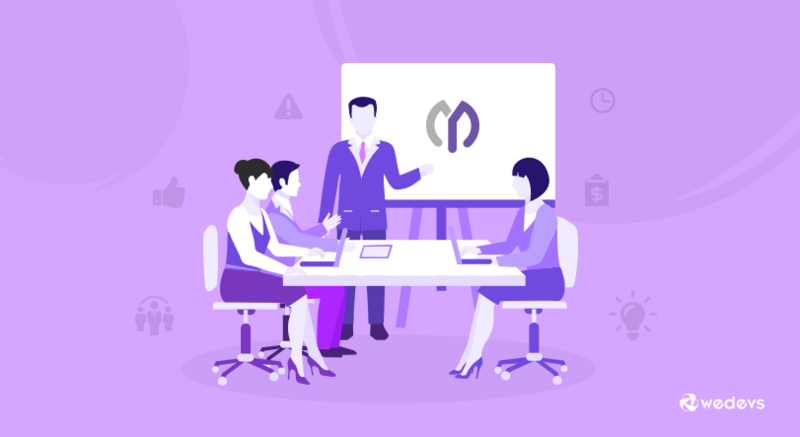 Considering all these and also the way we manage our project with the help of our very own project manager, we dreamed of a perfect project management solution. This guided our team to make this recent changes in functionalities and also design. Today, we are going to give you an overview of what is coming in terms of design and user experience. So, have a look into the things we are up to. When it comes to managing projects, many things need strict consideration. For example, organizing projects and managing them from a single place. Besides that, finding important things quickly really matter for an efficient workflow. Thus, we tried to make the Project list page as much lucrative as possible. 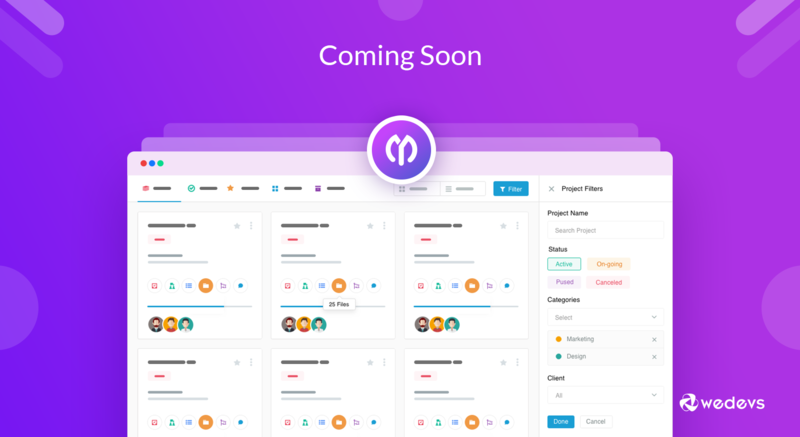 You will get a quick overview of every project including, their name, category, short description, stats (tasks, members, files, discussions) and also the progress so far. You might also get to mark projects as favorite to find them easily when needed! Also, there will be advaced filtering options. It will let you filter your projects based on their status, category, member, client etc. The task lists page is as important as the project page. 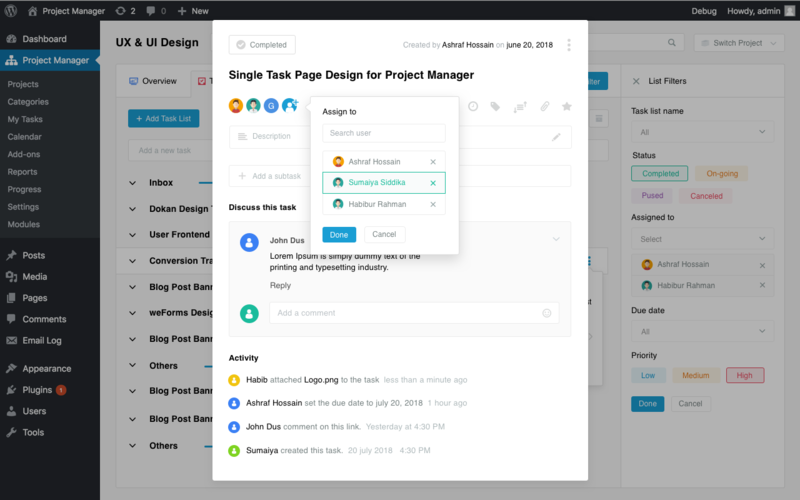 You will get to view a quick overview of each task list. Also, adding a task list or task in so convinient that you won't have to click any button or navigate to another page. Besides that, you will get filtering option for your tasks as well. 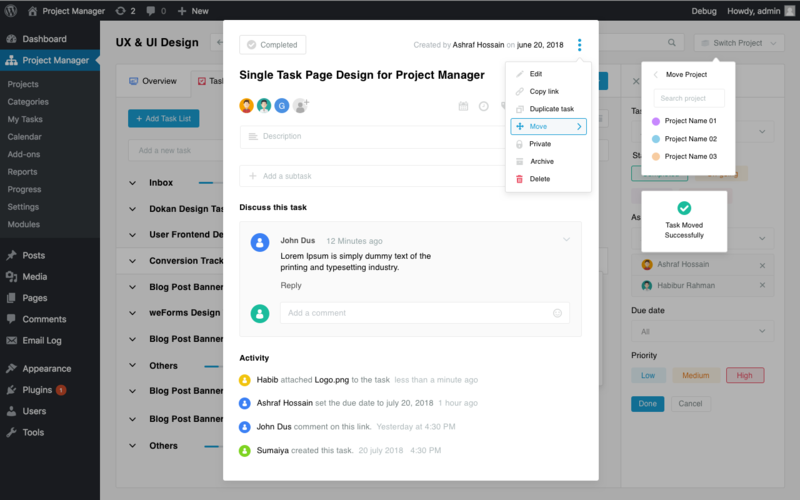 The new single task page is neat and will give you all the options and features that you will ever need. You will get all relevant and important information. 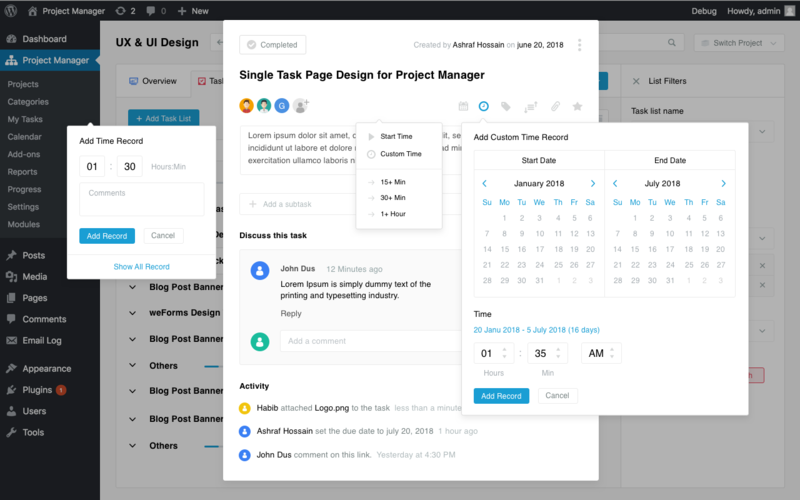 Add team members easily, add a description, including subtasks, discuss and also get an activity log. Even assigning team members to a task looks amazing! You will get options to manage your single tasks on the fly as well. You can edit, copy the link, duplicate task, move it to another list, archive and delete it anytime you want. The new version will give you the opportunity of prioritizing your task as Normal, Low and High. 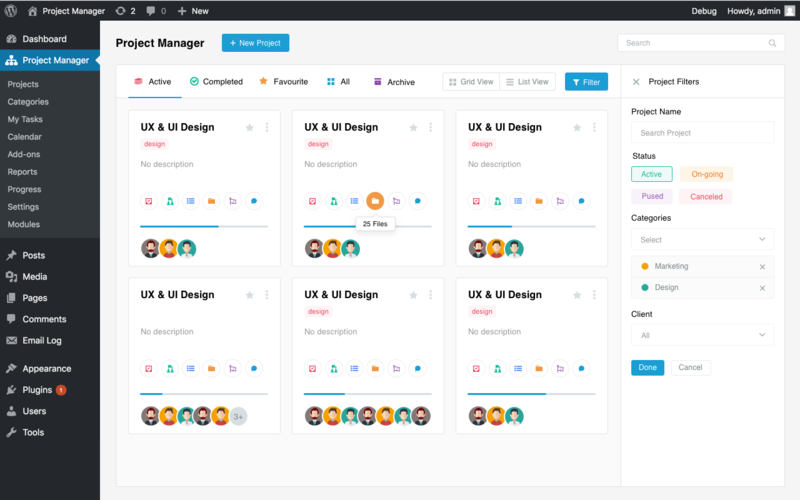 As you can see the new design will change everything and make WP Project Manager the ultimate solution for managing projects inside WordPress. We tried to provide a glimpse of the design that is coming soon. Also, we hope that you will love it and be able to perform effective project management. If you have any other suggestion on how we can improve the design or add new features, share in the comments. We promise to consider them giving high priority. If you haven't tried the latest version yet or upgraded to the premium version, you should definitely look at the version 2.0. What actually is “Pused” though? You mean “Paused” right? When will this new design be released? I’d like to see option to enter time estimate per task. With comparison to actual time. When task is marked complete, we can see estimate vs. actual. Also, it would be nice to close the single task page by clicking on the background. For mobile, move the close icon onto the task screen rather than outside. this way, we get full screen on mobile for single task view. WP Project Manager team is working on it. I cannot tell you the exact date, but it is being developed currently. And thank you very much for your suggestions. I have forwarded them to the development team. I would also like to see these features as they are very important while managing projects. Thanks for your queries. Well, currently there is no option inside the settings to change those texts. However, you can edit them using localized files – .PO, .MO files. For more information on how to do this, you can contact the support team. Also, in the future, there will be options to edit these texts. I have forwarded this feature suggestion to the development team. Hi there, I have noticed that on certain tabs of the project manager plugin in V2.0 the headline name is h1 and on other tabs its h2. As you can appreciate on my site I have always setup the titles of my theme and pages to be h1 which is going to be bigger font size than say h2. Obviously the categories h1 title is massive and I can change this on my theme but of course nobody wants their h1 titles to be the same size as the h2 titles. We haven’t implemented all the designs yet. We are putting them one by one with each new release. So, this issue will be fixed in the upcoming updates. You can also discuss this with the support team in detail. We are planning to bring a more robust and improved frontend design. As it is a single page application, the speed will not be affected by the design. I am sorry for giving you an wrong info. The design will work on the Frontend as well. When is this new update coming? I am using version 2.0.8 for the last number of weeks and was told that the update for this plugin should have been released last week via the support ticket area. Is it out shortly? All of these changes will not come in a single release, we are gradually adding them with each update. Our team was on Annual retreat in the last week. So, the update was little delayed. Hopefully, it will be released today. If the frontend is not going to be udpated with the new design, then when is it going to be updated? By the way, it looks awesome but we don’t give ( as I would assume most don’t) backend access to our users so until the frontend gets the update, we will not be taking advantage of the backend redesign. Just wondering if there are others that do not allow backend access on their sites. 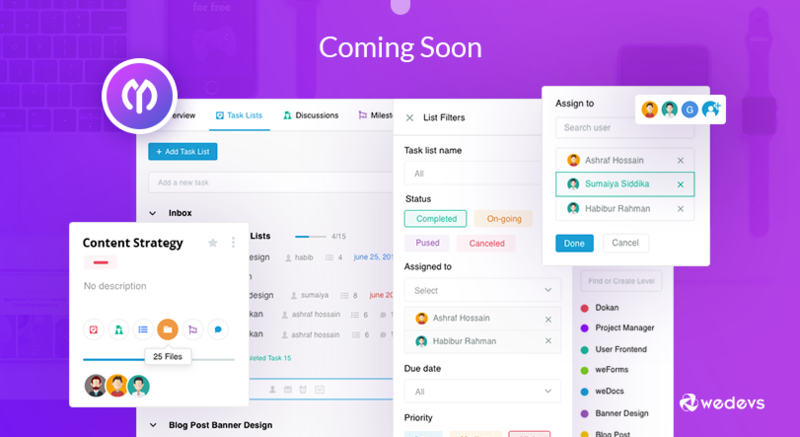 Do you know if the ability to schedule reminders for tasks is coming soon? end of the year? next year? Either way, it looks great and I hope the front end looks as great and/or plays nice with other site templates. This new UI is designed especially for the backend, but luckily it will work on Frontend too. We are working on a more robust premium Frontend design as well. It will take some time, but it will be available soon. I cannot give an exact date. Please bear with us until the announcement comes. 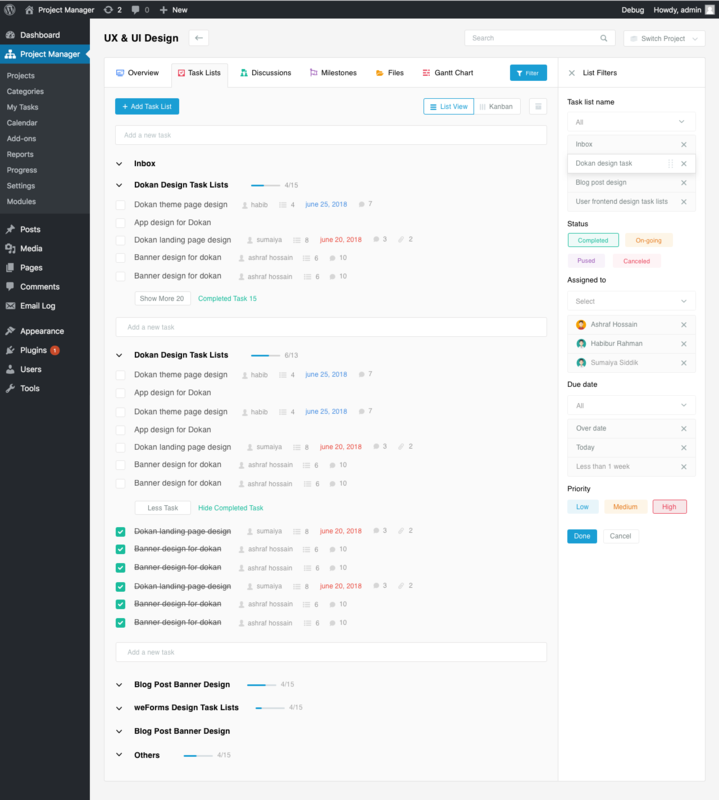 I guarantee you will love the frontend design that we are working on tirelessly.